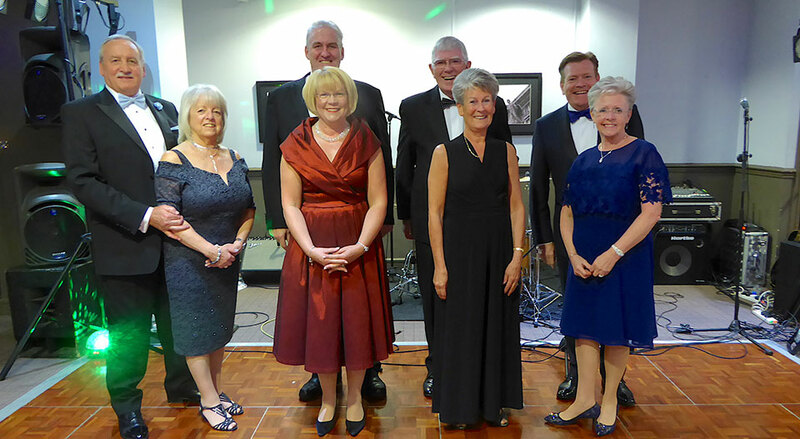 Over 150 members and their guests of the Woolton Group of lodges and chapters gathered for a ‘Black Tie’ gala dinner at the Village Hotel in Whiston. Following the success of last year’s Tercentenary Gala celebration, members had asked the group if another ‘Black Tie’ diner could be arranged and so it was. 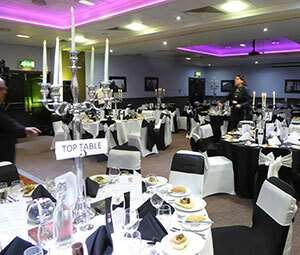 The staff at the hotel had dressed the room suitably and each dining chair was covered with a black or white cover and the tables were also suitably attired. 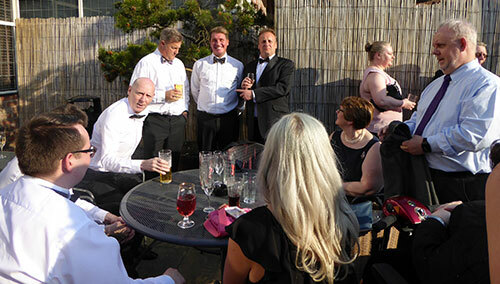 As the evening was warm and the sun was shining, many members and guests took their Prosecco onto the terrace prior to being called in for dinner. This was an ideal opportunity to meet with old friends and set the mood. The acting DC for the evening was Gary Devlin and at the appointed hour he requested that all should take their places in the dining room prior, to announcing the entrance of the group chairman Andy Whittle accompanied by his wife Amanda and the principal guest of the evening: “The Right Worshipful Provincial Grand Master Anthony Jackson.” (whoops!!) – a momentary stunned silence, then laughter broke out around the room prior to Gary correcting his error. A smiling Andy and Amanda followed by an even more smiling Tony and Maureen Harrison entered the room to great applause. The dining room is suitably attired. Grace was offered by the vice chairman Mike Cunliffe and the diners tucked into a festival menu of chicken liver pate on toasted crostini with plum chutney and blackberry, roast breast of turkey followed by chocolate and vanilla profiteroles with a dark chocolate sauce. This was followed by coffee and mints. After a leisurely meal, during which stewards passed around the tables selling raffle tickets for a plethora of prizes, Mike Cunliffe returned thanks and the loyal toast was given by Andy Whittle. The wife or partner of each master or first principal attending was presented with a beautiful bouquet of flowers and the last one was presented to Maureen Harrison, as Tony was deemed to qualify as the master of the Provincial Grand Lodge! Tommy Lunt had recently received the prestigious honour of receiving the rank of Past Provincial Senior Grand Warden for all the exemplary work he has done as accommodation officer for the group for the last 11 years and he has now stepped down to spend time with his family. His daughter Sarah has chauffeured him around taking him to and from the golf club and Andy Whittle recognised this by presenting her with a bouquet of flowers and Tom with a bottle of liquid refreshment. Pictured from left to right, are: Sam and Julie Robinson, Andy and Amanda Whittle, Tony and Maureen Harrison, Kevin and Susan Poynton. Kevin Poynton in his usual eloquent style presented the toast to the Woolton Group praising the work that the executive had done in making the group what it is today – a fine group, saying that he and Sam Robinson really enjoyed attending the golf club. The final toast was again given by Andy Whittle, that being the toast to the ladies and non-Masonic guests. It was then time for a break after all the speeches, so the lights were dimmed, and the DC introduced the entertainment for the evening, ‘The Brothers Grim’, who in a very short time had lots of the diners dancing. Background music was provided during the meal and between the ‘spots’ by the resident hotel disco. During the first interval the raffle was drawn and had raised £765 and the all-important 13 pence in favour of the MCF 2021 Festival. The evening was a great success, and everyone looks forward to doing it all again next year.